One of our reasons for wanting to go to on our Bhutan trip in February was to see the annual Nomad Festival. 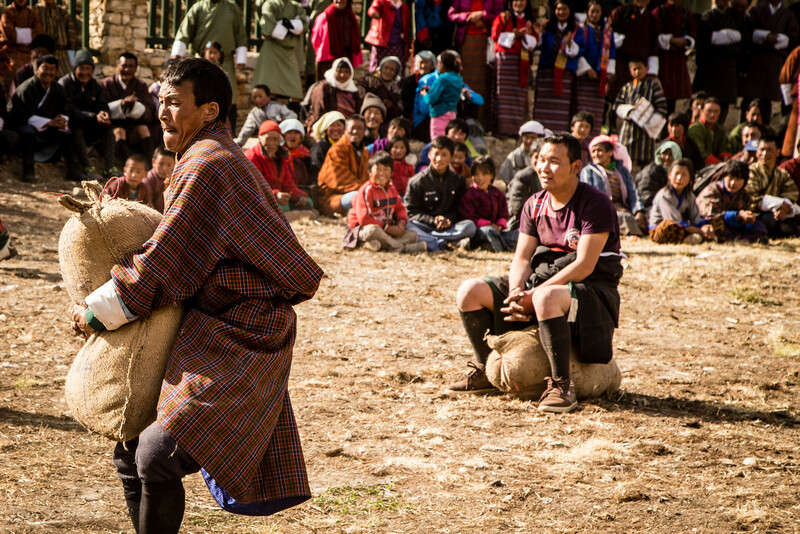 Every year nomadic herders from Bhutan’s Himalayan frontiers and nearby gewogs (villages) gather in central Bhutan’s Bumthang district to dance, trade, compete in games and from what I could tell just let loose and enjoy the end of winters grip. The mountains in this remote area offer some of the harshest weather on the planet and now that the lilacs were starting to rise it was easy to tell that everyone was ready to socialize and shake off the winter chill. 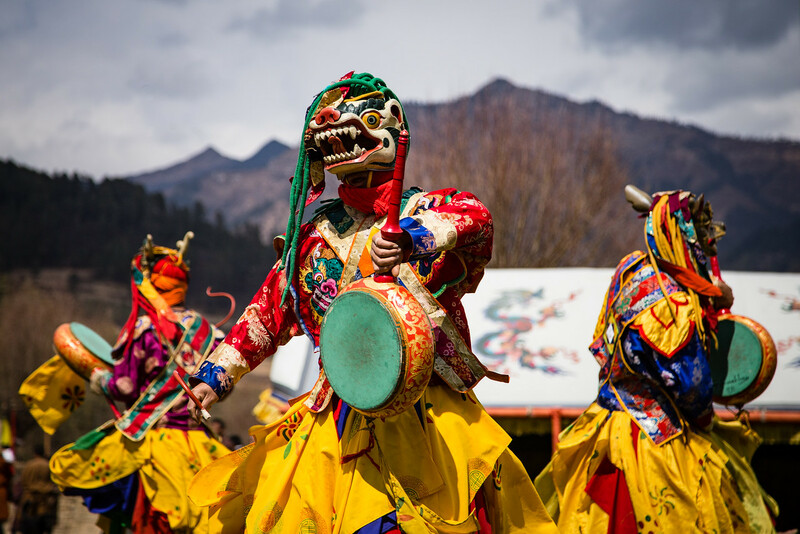 The Bhutan Nomad Festival is an unforgettable celebration of Bhutan’s unique culture and traditions. 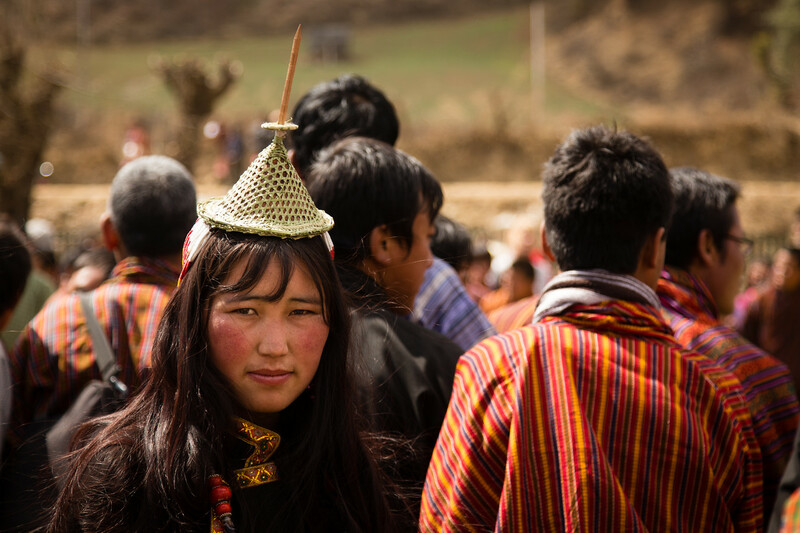 Over the course of the five years since the Nomad Festival began, fewer than 300 non-Bhutanese have been able to witness the festival and we were honored to be invited. We had been driving through the Himalayas on our Bhutan trip, only a few hours from Trongsa and I was beginning to wonder what we were getting into. Finally, our guide Norbu said, “Ah, here we are”. Well, it turns out “here” was the beginning of a gravel road snuggled tightly to the mountain with hairpin turns and sheer cliffs on either side. It was beautiful scenery and the driver handled it expertly but I still cinched my seatbelt a little tighter, as if that would help in case of a momentary misstep. About 45 minutes and 22 kilometers later we spotted a large riverside fairground filled with several hundred celebrants. Everyone was in traditional dress; gho, a knee-length robe tied at the waist for men and ankle-length dresses known as the kira for the women. The sounds of cymbals, drums, horns, the blowing of conch shells and bells filled the air. There were dancers in colorful papier-mâché masks —the origin of which date back to the 8th century called cham — were performing ancient dances celebrating Buddhism and Guru Rinpoche, a man who some Bhutanese consider the Second Buddha. Many more dances followed and then the festivities stopped and everyone —performers, vendors, officiates and visitors — had a picnic lunch. In the afternoon there were athletic competitions including the shot-put, tug of war and the highlight; the strongman competition. Everything seems to be fueled by the thrill of seeing old friends after a long winter and perhaps just a little bit of moonshine known as arra. I was invited to participate in the strongman competition but I didn’t want to show everyone up with my athletic prowess no matter how appealing it was to be offered the chance to lug various 100-kilogram objects on a 100-meter course. Check out more photography from our Bhutan trip here.